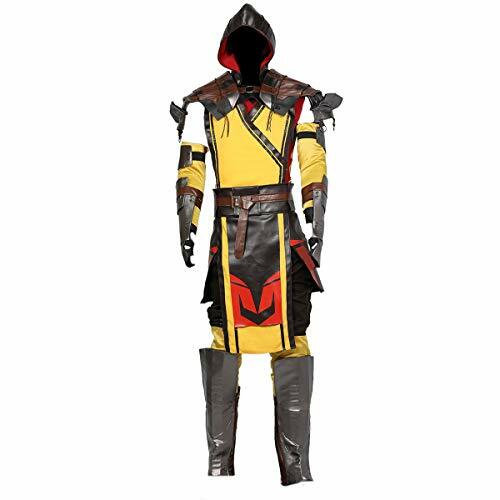 The whole outfit consists of a black hoodie shirt, a pair of black pants, a yellow tabard, a yellow mask, two arm guards, and two leg guards. One piece pajamas are the ultimate comfy sleepwear piece. They are perfect for lounging around the house, movie nights and sleepovers. This pajama features stitched character accents, removable footsies with grip and a hoodie. It is made of 100% polyester. Sub-Zero. Blue. The whole outfit consists of a black hoodie shirt, a pair of black pants, a blue tabard, a blue mask, two arm guards, and two leg guards. Become the deadly 10,000 year old assassin from Edenia and step daughter of Outworld's fearsome Shao Kahn in this Mortal Kombat Kitana Costume. The blue outfit is designed to look like the fighting game princess and includes a top with front laces, shorts with a long attached apron, arm bands, gauntlets boot tops, and a matching headpiece and face mask. The adult Halloween costume is an ideal outfit for parties, character reenactments, parades, character conventions and other holiday productions and festivities. All items and accessories in this outfit set are constructed from a shiny blue material and trimmed in gold. Look amazing while pretending to be your favorite fighting game and big screen character with this Mortal Kambat Halloween costume modeled after the beautiful and deadly Princess Kitana. 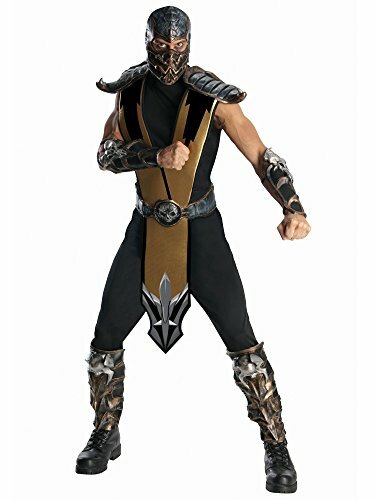 Strike fear into the heart of your enemies when you show up to the Halloween party dressed in this Mortal Kombat Scorpion Costume. Scorpion is a ninja from the video game and movie franchise Mortal Kombat. This costume comes with A long-sleeve black jumpsuit that features yellow and gold accents on the calves and sleeves. A decorative tabbard with attached belt slips on over the jumpsuit. 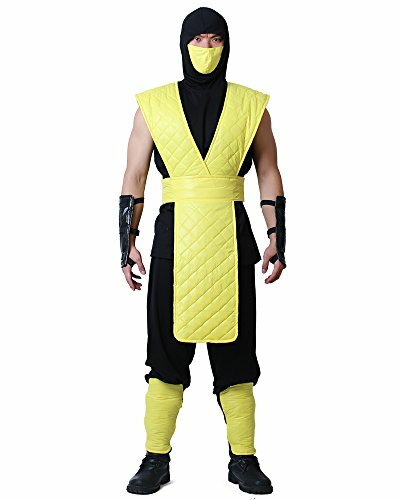 Top off the Scorpion Halloween costume with the included mask. 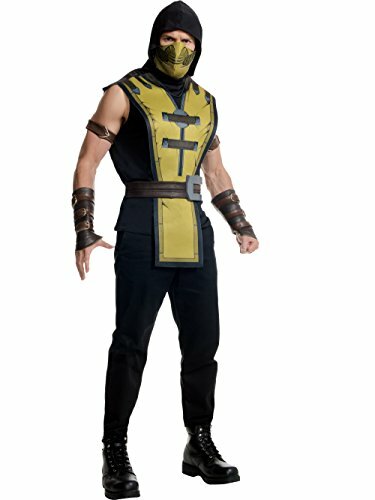 The Adult Mortal Kombat Scorpion Costume includes mask, tabard, belt and gauntlets. Adults love to celebrate Halloween too so get costumes and accessories this year that really make a statement like this one. 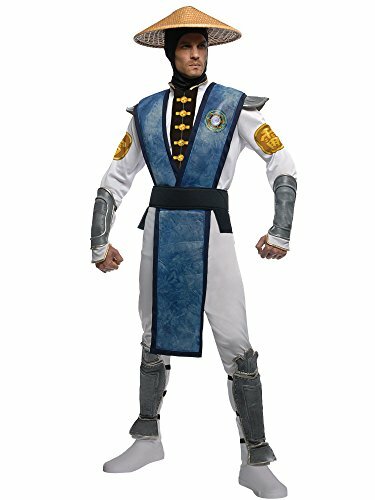 The Adult Mortal Kombat Sub-Zero Costume includes mask, tabard, belt and gauntlets. Adults love to celebrate Halloween too so get costumes and accessories this year that really make a statement like this one. Teleport your way in to our Raiden Mortal Kombat Adult Costume this Halloween. Included in this set is a jumpsuit with an attached tabard, molded shoulders, belt, hood, hat and gauntlets. The white jumpsuit is designed with a faux Mandarin-style collar with gold buttons and gold symbols on both sleeves. Additionally, molded silver armor fits on the shoulders. 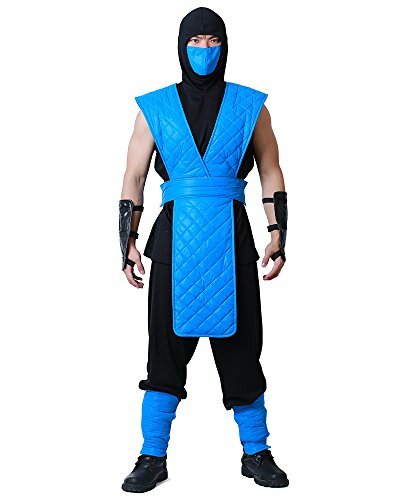 The blue tabard, which hangs slightly below the knees and between the legs, displays the Mortal Kombat logo over the heart. Wear this over the jumpsuit and molded shoulders and Raiden's look begins to take shape. Place the silver gauntlets, designed to look like iron, over your lower arms and legs and prepare to defeat your enemies. Top the look off with the black hood and straw harvester-style hat and you will be unstoppable in this legendary video game-themed costume. Raiden is one of the most powerful characters in all of Mortal Kombat, make sure you order this costume today! Be ready to save mankind with this fun and flirty Mortal Kombat Sonya Blade Costume. It will transform you into the tough-as-nails soldier that's ready to compete with anyone. This adult Halloween costume includes a high-collared, green army top with pockets, buckles and a printed badge. It also comes with matching pants with an attached belt, a leg holster, black gloves, arm pieces, and elbow and knee pads. This Sonya Blade Halloween costume is available in women's' sizes with material made from comfortable polyester. Just add knee-high boots and makeup and you will be ready for the party. This costume is easy to care for and is ideal for Halloween, character reenactments, parades and other fun festivities.